Born in Cleveland, Ohio, USA, Kitaj studied at the Cooper Union Institute in New York in 1950–1 and 1952, and at the Academy of Fine Art, Vienna, following a period of travel in Central and South America as a merchant seaman. After moving to Britain he completed his art training at the Ruskin School of Art, Oxford from 1958–9, and at the Royal College of Art, London from 1959–61. His first one-man exhibition was held at Marlborough Fine Art, London in 1963. Kitaj held teaching posts in America during the 1960s and early 1970s, at the University of California at Berkeley and at Los Angeles, returning to London in 1972. His 1983 marriage to his second wife, the American artist Sandra Fisher (1947–94) is celebrated in his paintings Cecil Court, London WC2 ('The Refugees') and 'The Wedding', both in the Tate Collection, which are rich with Jewish symbolism. In 1976 Kitaj selected a group of works by British artists to form the core of an exhibition for the Arts Council of Great Britain, 'The Human Clay'. In an accompanying essay he described this group of artists as representing a School of London and this became a defining moment in British twentieth-century art history, with the members of the ‘School’, gradually honed to an almost fixed ‘core’ of six or seven painters, including Michael Andrews, Frank Auerbach, Francis Bacon, Lucian Freud, Leon Kossoff as well as Kitaj himself. As both an insider and outsider, simultaneously at the heart of the contemporary British art establishment, and also an American Jew – personal identity and, latterly, a broader Jewish identity – are at the heart of Kitaj’s later work. This subject is also addressed in print in his 1989 publication, 'First Diasporist Manifesto'. 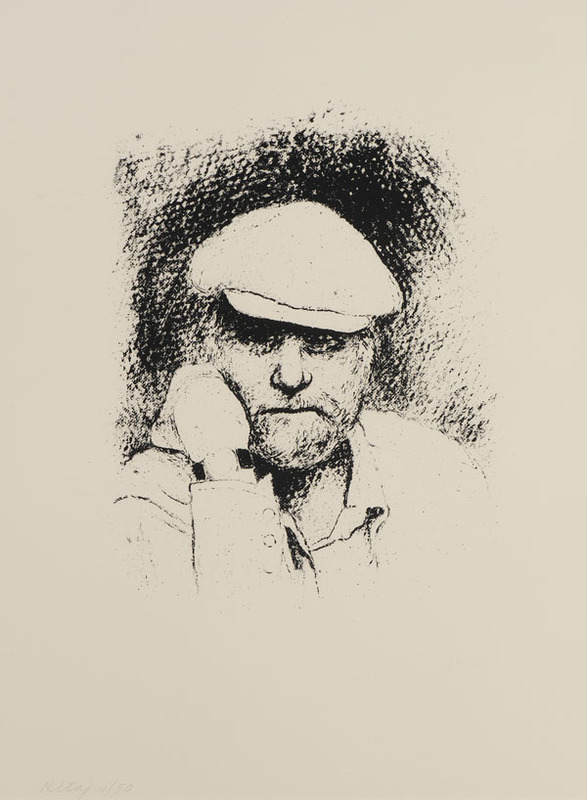 Kitaj was elected to the American Academy of Arts and Letters in 1982 and to the Royal Academy in 1985. However, in the wake of the savage response to his 1994 Tate exhibition by a number of British art critics, and the sudden death of his wife only weeks after its opening, Kitaj relocated to Los Angeles in 1997, where he was debilitated by Parkinson’s disease. He took his own life in 2007.